How? She Used Vindale Research Surveys! I recently came across a story that we wanted to share with you. I was browsing Youtube and came across a video by a young woman called Lindey Glenn. She explains in detail how she made $50 every week on a simple paid survey site called Vindale Research. She did this while she was breastfeeding her new baby! The breastfeeding process does not really let the feeder do anything else simultaneously, certainly it is very difficult to make money during the feeding process! We thought it would be nice to share her story with you guys! Disclosure: Please note that some of the links on this page are affiliate links. This means that we may earn a commission, at no cost to you, if you decide to make a purchase after clicking through the link. Please understand that we have experienced all of these companies, and we recommend them because they are helpful and useful, not because of the small commissions that we receive if you decide to buy something through our links. Please do not spend any money on these products unless you feel you need them or that they will help you achieve your goals. After watching her Youtube video (below), I signed up for Vindale Research and within a few minutes I had made $4 from a couple of easy surveys. 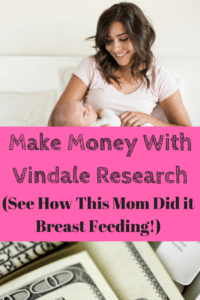 Vindale Research is a very easy way to make a little extra money! The Vindale Research survey site was one of the first online survey sites that paid people to complete surveys. The site first appeared about 12 years ago and has improved dramatically over the years. Vindale now has an ‘A-‘ rating from the Better Business Bureau, although a few years ago it was rated only a ‘C’. Clearly, they have been improving the site and the A- rating shows that is a company that can be trusted. Plenty of other people have written reviews about Vindale, Generally, they agree with our experience. However, some reviews can be pretty negative and I wanted to give you a clear picture of the site. So here are the most negative reviews that I have been able to find about Vindale. Vindale is registered with the Better Business Bureau and they have an ‘A’ rating which is excellent – it means they are a very trust worthy company. You can check out their page on the BBB here. They pay out with Paypal or check. Payment is twice a month but the minimum payout is $50 which is really high for a paid survey company. You should probably only use Vindale Research if you know that you will stick with it and actually reach the $50 minimum payout so that you don’t waste your time. The pay per survey completion time is very good. A few minutes can earn you $2+ or more. Honesty – if a survey gives an estimated time for completion – my experience with Vindale Research is that the survey can be completed in an even shorter time! This is not my normal experience with paid surveys. Emails that tell you surveys are available – frequent notifications for surveys that I qualify for have impressed me. I rarely get rejected from surveys on the site. I have found that the surveys are very interesting and that they often reveal the details of cool new products that are in development for future release. For example, a survey I completed yesterday introduced me to the features of the new ‘smart speaker’ device (like the Amazon Echo) that will be on sale this Christmas. Money Making Tip: The ‘Mystery Study’ surveys that Vindale Research emails to you (when they become available) are the highest paid per minute of your time. They generally range from $1-$3 and will only take a couple of minutes of your valuable time. I really only complete the Mystery Study Surveys – usually they are sent to you once or twice every single day. This is probably the best way in my opinion to make a little extra money with Vindale Research. I have added Vindale Research surveys to my daily to-do list just for the Mystery Topics feature. I don’t really need to complete surveys that take a long time to complete (I make most of my online income from blogging). I am a little addicted to completing survey sites though! When I am bored at the grocery store or waiting in a line, I just pull out my cell phone and complete a couple of short surveys – why not use the time productively? The way to make the most money with this site is to ensure that you qualify for as many surveys as possible. Survey sites do not like people that work in media or journalism or marketing! Always answer the qualifying questions honestly, but just realize that you will likely not qualify for many surveys if you put your occupation as ‘marketer’. This is just how it is unfortunately. Unfortunately, the minimum balance that you must have is quite high – you need to earn a minimum of $50 before Vindale will send you payment. This will likely take you anywhere from 3 days to a week to earn, so it is not a huge deal. However, other sites that I have tried (SurveyMomma, Survey Junkie, Swagbucks etc.) have much lower payout thresholds. This is an excellent tutorial that we found that can really help you maximize your earnings on Vindale Research. Hopefully, this video can help you make the most from the site. Vindale Research is a great place to begin if you want to make a little extra money doing market research surveys. The survey questions ask about your opinions on products that exist and products that are in development. No skill is required and it is totally free to join Vindale. When you reach the $50 cash out threshold – you can take a selfie with the check and receive more rewards! There are lots of different ways to make money on the site and I highly recommend that you sign-up and see if Vindale Research Surveys are a good fit for you. 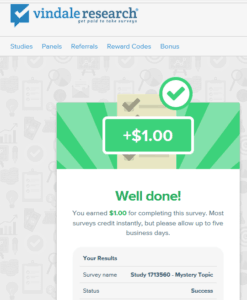 Survey Junkie Review – the BEST Survey site! Swagbucks Review – Get Money Back For FREE! We hope that you give Vindale Research Surveys a try! Let us know in the comments if you have had any experience (good or bad) with Vindale Research! Although I have never done surveys, most of what I do read are not so positive.As said, I have never done surveys because if you`re living outside USA, Canada and the UK, surveys are few and far between.This was informative and I`ll try out Vindale research to see if it`s different. Hi thank you for your comment, I agree that those countries do tend to be the only ones that allow people to qualify for surveys. Surveys can be frustrating, it seems like only a few survey sites are worth bothering about, and even those ones will only help to supplement your income rather than provide a full time living. I hope you get some benefit from Vindale Research – it seems to be one of the better survey sites that I have tried so far. I don’t focus on paid survey sites, but sometimes I will make a goal that I will complete survey sites to make money to pay for an ebook (about blogging or Pinterest for example) that I want. When I reach the goal I buy the book and that usually has more value than the money I made from the hours of surveys!